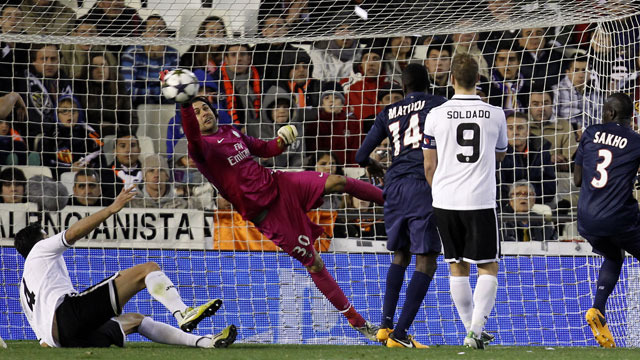 The French side secured 2-1 victory over the Bats at Mestalla and needs just a draw to qualify for the Champions’ league last-8 round. PSG have suffered a shocking 1-0 defeat against the struggling 10-men Reims in their latest Ligue 1 encounter, despite the appearance of David Beckham from the bench. Ancelotti will do his utmost to convince his players avoiding the complacency in the game against Valencia and guarantee the job done. Valencia saw the deserved victory slipping from their hands in the dying stages of their latest La Liga game as they were held to a 2-2 draw by Levante in a local derby. However should they show the same outstanding attacking display they did against the bitter rivals, they could battle to a victory at the Parc des Princes. Zlatan Ibragimovich has been suspended for three games after being sent off in the stoppage time of the Champions league last-16 first leg. The Sweden forward who has taken part in recent PSGs’ 1-0 defeat to Reims will be most likely replaced by Kevin Gameiro. Marco Verratti is set to miss the game against Valencia due to suspension, with Ancelotti facing a tough choice whether to team up David Beckham or Thiago Motta with Matuidi in the centre of the pitch. Despite Thiago Silva recovering from injury, Ancelotti is unlikely to throw his key player straight back into action. Sakho, Alex or Jallet could be preferred in the heart of PSG defense instead of the error-prone Gregory van der Wiel. The Bats’ defensive duo Adil Rami and Ricardo Costa will definitely miss the clash with the French giants due to injuries, while Jeremy Mathiu returns into the first XI. Roberto Soldado, who is leading team’s goal-scoring charts with 13 goals, set to feature in the game. Sofiane Feghouli will also try to put an end to PSG’s dreams of claiming the Champions League title for the first time in their history.